As you know, the 8th Annual St. Matthew’s Car Show will be held this year on October 13th, 9:00 AM to 3:00 PM, rain or shine. We are again excited to donate much of the proceeds from the show to The Place of Seven Springs. This year, a portion of the proceeds will go to our Youth Ministry at St. Matthew’s to be used to refurnish the classrooms affected by the flood last year. Seven Springs is part of the Gwinnett Coalition of Health and Human services. Families and individuals are referred to them for assistance with emergency housing, utilities and non-narcotic prescription medication. They have a food co-op and operate a Summer Lunch Program for homeless children. We encourage you all to learn more about Seven Springs and we invite you to visit their facility on Hwy. 78. As always, the Car Show needs your help. There are many ways to do that. We will need volunteers on the day of the show, sponsors for trophies and t-shirts, raffle items, silent auction items, arts and crafts vendors for our vendor area and cars, cars, cars!! You can also be a sponsor for the show. Sponsorship levels start at $200 and go up to $1500 and beyond. We are also in need of Corporate Sponsorship. Corporate Sponsorship levels would begin at $2000. The Corporate Sponsor name would be added to all banners, our website and offered show space the day of show. Their name would be announced throughout the day of show and a sponsor plaque would be awarded to the Corporate Sponsor the day of show. We are looking forward to a very successful show this year, not only in raising money for two very worthy causes, but for a great fellowship event again. So please consider helping in any way you can to make this one of our best years yet. 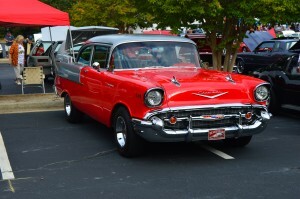 Over 100 vintage cars, trucks, and motorcycles registered and competed for trophies and bragging rights in the Seventh Annual St. Matthew’s Car Show. Many thanks to all who helped make this such a successful event. Funds raised will benefit The Place of Seven Springs Ministries in Snellville.